French folding door is one of the most stylish and unique accordion doors that offer lots of great benefits. One of its unique features is the degree of customization that can be done with it. Aside from the different colors of its panels, its glass and solid part can be divided depending on the clients preference. 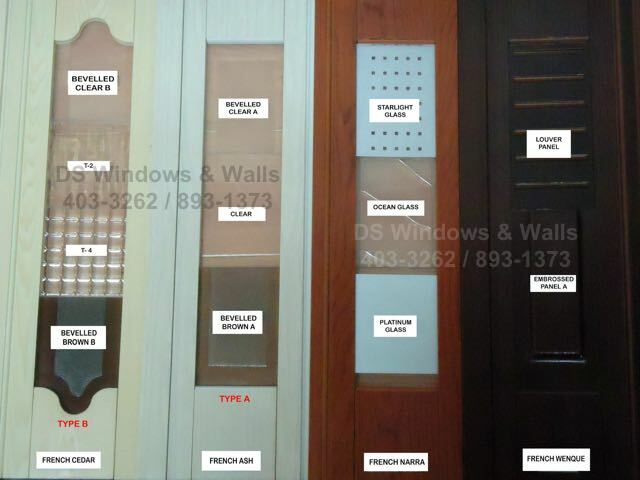 We offer different glass option that is energy efficient, tinted, decorative and available in different textures. 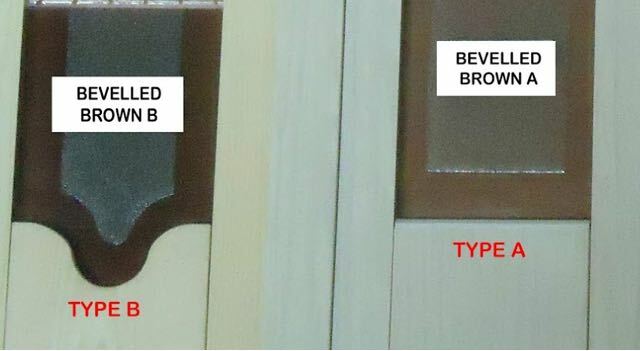 Some of our glass designs are the Beveled glass both available in clear and brown that can also be shaped into type A as seen in the 2nd picture or the type B i.e. one that has curvy shape glass. We also have T-2, T-4 and ocean glass design with unique texture and a little blurry for more decorative feature. For a more opaque style we also offer starlight glass and platinum glass design that provide more concealment on the glass. And lastly, the Clear glass design a lot of homeowner and commercial designer prefer more simple and plain design in their accordion door glass because it can look more sophisticated and modern at the same time. Another unique feature of French Folding Door is the combination of the glass and solid part. The solid part that can be matched to any glass design which is the embossed or louver design. French folding door with louver in the lower section comes with very useful advantages such as places that require a consistent air flow, especially if it’s used in laundry rooms and walk-in closet. Louver has built-in small horizontal slats that ensure ventilation. 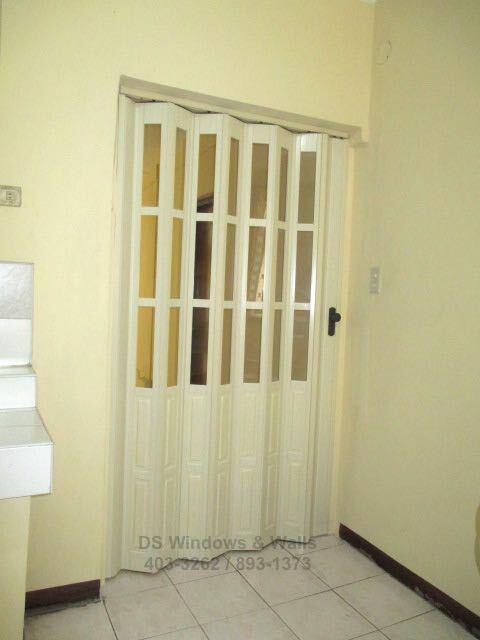 On the other hand, if you install French folding door for the purpose of securing the air circulation inside an air-condition room choosing an embossed design on your French accordion door would be more suitable. 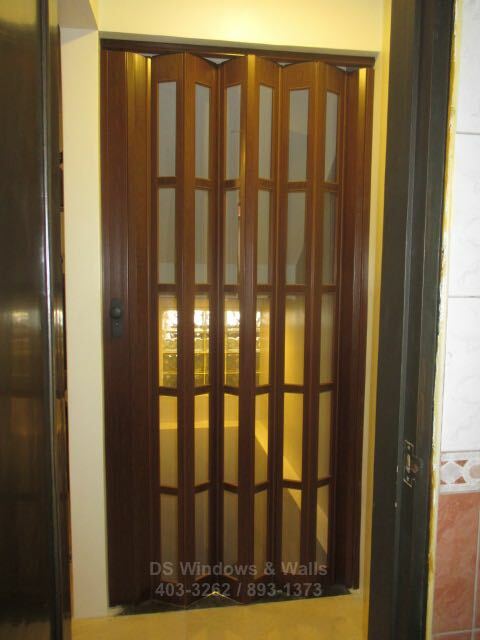 The French Folding Door can be full glass or half glass, half solid part like the 1st and last photos. French Folding Door with the combinations of embossed or louver at the lower section matching a translucent glass in the upper part allows you to combine your creativity and privacy at the same time. Yet there’s also a time that choosing a full glass French accordion door can be more attractive rather than with the combination. As you can see in the picture below using a full glass with Bevelled Clear A glass and wengue frame color appear more trendy and stylish. French Folding Door is one of the most innovative accordion doors with a unique design and custom-built in different color, glass design and various combinations available. It’s functional, space saver, affordable and a great additional decorative interior door or divider in both residential and commercial areas.